A rapier is a slender, sharply pointed sword, ideally for thrusting attacks, used mainly in Europe in the 16th and 17th centuries. The word "rapier" generally refers to a relatively long-bladed sword characterized by a complex hilt which is constructed to provide protection for the hand wielding it. While the blade might be broad enough to cut to some degree (but nowhere near that of the wider, slightly heavier swords in use around the Middle Ages), the long thin blade lends itself to thrusting. The blade might be sharpened along its entire length, sharpened only from the center to the tip (as described by Capoferro), or completely without a cutting edge as called “estoc” by Pallavicini, a rapier master who, in 1670, strongly advocated using a weapon with two cutting edges. A typical example would weigh 1 kilogram (2.2 lb) and have a relatively long and slender blade of 2.5 centimetres (0.98 in) or less in width, 1 metre (39 in) or more in length and ending in a sharply pointed tip. 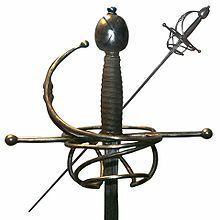 It is important to remember that the word “rapier” was not used by Italian, Spanish, and French masters during the apogee of this weapon, the terms spada, espada and épée (or espée) being instead the norm (generic word for “sword”). Because of this, as well as the great variation of late-16th and 17th century swords, some like Tom Leoni simply describe the rapier as a straight-bladed, two-edged, single-handed sword of that period which is self-sufficient in terms of both offense and defense, not requiring a companion weapon. In order to avoid the confusion of lumping all swords together, some categorize such swords by their function and use. For example, John Clements categorizes thrusting swords with poor cutting abilities as rapiers and categorizes swords with both good thrusting and cutting abilities as cut and thrust swords. Some however see the rapier in its entire time-line and see that it never truly fits into any single definition. Largely all over Europe the weapon changed based on culture and the fighting style that was prescribed; be it Italian, Spanish, or some other instruction on the weapon's use, so that lengths, widths, hilt designs and even the lack or placement of an edge or edges differed at the same time. One might wear a rapier with a swept hilt and edges on the same day as another might wear one with a cup hilt and an edgeless blade. Rapiers often had complex, sweeping hilts designed to protect the hand wielding the sword. Rings extended forward from the crosspiece. Later these rings were covered with metal plates, eventually evolving into the cup hilts of many later rapiers. Many hilts included a knuckle bow extending down from the crosspiece protecting the hilt, which was usually wood wrapped with cord, leather or wire. A fat pommel (often decorated) secured the hilt to the weapon and provided a balance to the long blade. Various rapier masters divided the blade into two, three, four, five or even nine parts. The forte, strong, is that part of the blade closest to the hilt; in cases where a master divides the blade into an even number of parts, this is the first half of the blade. The debole, weak, is the part of the blade which includes the point and is the second half of the blade when the sword is divided into an even number of parts. However, some rapier masters divided the blade into three parts (or even a multiple of three), in which case the central third of the blade, between the forte and the debole, was often called the medio, mezzo or the terzo. The Ricasso is that portion of the blade, usually unsharpened, which extends forward from the crosspiece or quillons and which is protected by the complex hilt. The rapier began to develop around 1500 as the Spanish espada ropera, or "dress sword". The espada ropera was a cut-and-thrust civilian weapon for self-defense and the duel, while earlier weapons were equally at home on the battlefield. Throughout the 16th century, a variety of new, single-handed civilian weapons were being developed, including the German Rappier, another cut-and-thrust weapon used for sportive fencing, as described in Joachim Meyer's Fechtbuch of 1570. 1570 is also the year in which the Italian swordmaster Signior Rocco Benetti first settled in England advocating the use of the rapier for thrusting as opposed to cutting or slashing when engaged in a duel. 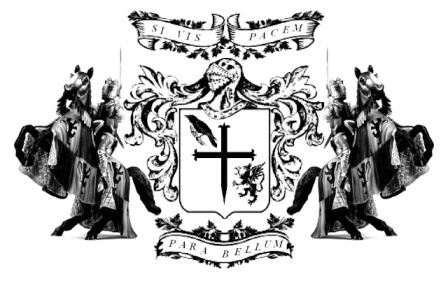 Nevertheless, the English word "rapier" generally refers to a primarily thrusting weapon, developed by the year 1600 as a result of the geometrical theories of such masters as Camillo Agrippa and Ridolfo Capoferro. The rapier became extremely fashionable throughout Europe with the wealthier classes, but was not without its detractors. Some people, such as George Silver, disapproved of its technical potential and the duelling use to which it was put. The etymology of the word rapier is uncertain. Charles du Fresne, sieur du Cange, in his Glossarium mediae et infimae Latinitatis, cites a form Rapperia in from a Latin text from 1511. He mentions an etymology deriving the word from the Greek ραπίζειν "to strike." However, Walter William Skeat suggested that "rapiér" may derive from raspiére, a poker, and that this may be a contemptuous term developed by older cut-and-thrust fencers for the new weapon. The most probable root of this term, however, appear to be from the Spanish ropera that comes from ropa, or elegant dress, thus a "dress Sword". Allowing for fast reactions, and with a long reach, the rapier was well suited to civilian combat in the 16th–17th centuries. As military-style cutting and thrusting swords continued to evolve to meet needs on the battlefield, so did the rapier continue to evolve to meet the needs of civilian combat and duels, eventually becoming lighter and shorter. This is when the rapier began to give way to the small sword. By the year 1715, the rapier had been largely replaced by the lighter small sword throughout most of Europe, although the former continued to be used, as evidenced by the treatises of Donald McBane (1728), P. J. F. Girard (1736) and Domenico Angelo (1787). * Jerónimo Sánchez de Carranza, De la Philosofia de las Armas (1569). * Luis Pacheco de Narváez, Libro de las Grandezas de la Espada (1599). 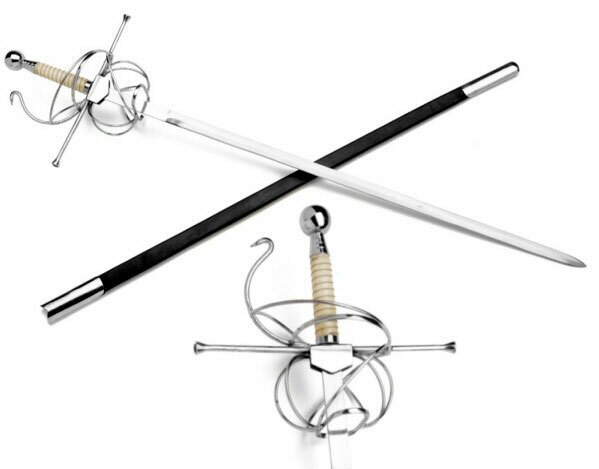 Classical fencing schools claim to have inherited aspects of rapier forms in their systems. In 1885, fencing scholar Egerton Castle wrote "there is little doubt that the French system of fencing can be traced, at its origin, to the ancient Italian swordsmanship; the modern Italian school being of course derived in an uninterrupted manner from the same source." Castle went on to note that "the Italians have preserved the rapier form, with cup, pas d'ane, and quillons, but with a slender quadrangular blade." * Despite the rapier's common usage in the 16th–17th centuries, many films set in these periods (many starring Errol Flynn) have the swordsmen using épées or foils. Actual rapier combat was hardly the lightning thrust and parry depicted. Director Richard Lester attempted to more closely match traditional rapier technique in Three Musketeers and The Four Musketeers. Since then, many newer movies, like The Princess Bride and La Reine Margot have used rapiers rather than later weapons, although the fight choreography has not always accurately portrayed historical fencing techniques.